Last month, I had the pleasure of reviewing the Motorola Droid for Verizon Wireless. I became so attached to it that I had a little separation anxiety when I sent it back. 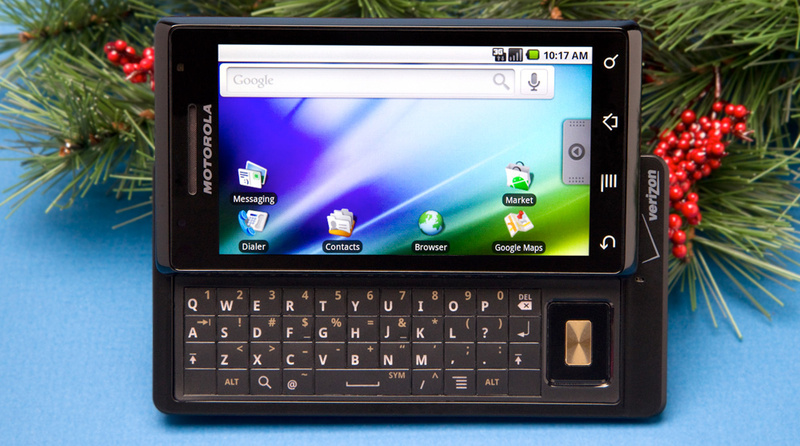 Christmas came early for me this year; Verizon gave me the opportunity to check out the Droid’s improved Android OS 2.0.1. The over-the-air update is available for free even if it wasn’t available when you first purchased it. Android 2.0 was by no means slow. The update did make some noticeable improvements on speed and stability. Programs open, close, and switch quicker than before. The most obvious change when you first open the Droid is in the “unlock” screen. 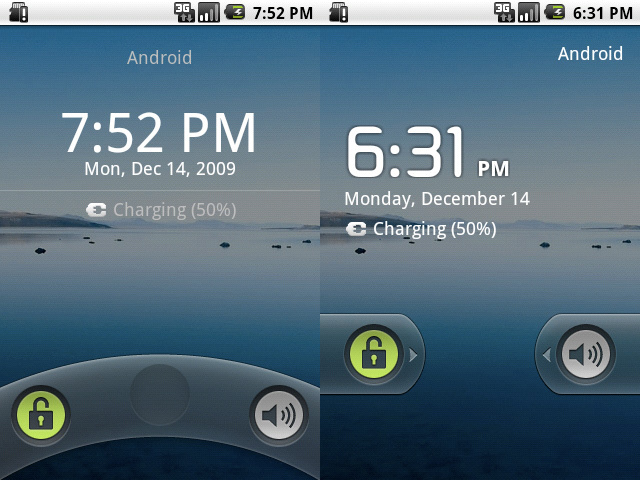 Though the principle is the same, the interface uses drag-able “tabs” rather than the “wheel” used in 2.0. This is Verizon’s claim and not my own, however, the phone did last the grueling holiday drive from Sacramento to San Diego with some juice to spare. That includes a solid two hours of music streaming with Pandora and a half hour of using Google Maps Navigation to find my way out of a shady corner of Los Angeles. Some people have reported problems with the Droid’s auto focus ability. The update fixes this and shortens the delay time between shots. Somehow, Google managed to improve the already impeccable audio during calls. The difference isn’t drastic in my opinion, but I’ll take their word for it. I never ran into this problem before, but when receiving a call on call waiting, the speakerphone turns off. The speakerphone now remains on. The update eliminates the background echo created when using a Bluetooth headset. If you have a car like the Lexus R400h which allows you to transfer contacts via Bluetooth, you are in luck. Android 2.0.1 improved the ability to beam up your phone book with Bluetooth. You can now send text messages and multimedia messages to seven-digit numbers. Also, you can merge contacts with seven-digit numbers. Verizon Visual Voice Mail provides an interface for your voice mail. It allows you to view caller information and voice mail information for each message without having to deal with the standard “to replay this message, press 7, etc.” New voice mail messages now appear right after they arrive. It used to take a few minutes for the message to show up. WiFi access has also been enabled. On another note, I’m hoping Google finds a better way to control the audio volume. Right now, there are separate volume levels for calls, ringer, media playback, and navigation. To adjust the volume, you have to open a corresponding application and then use the buttons on the side of the phone to adjust the volume. For instance, I have to open the media player to change the media playback volume. So, if I’m listening to music at a reasonable level and the navigation decides to scream at me, I have to switch to the navigation application to relieve my ears. I’d like the side buttons to control the master volume have individual volume controls in the notification area. That way when I need to make a “LEFT ON ANDERSEN PARKWAY IN ONE QUARTER MILE!”, I can quickly turn it down. FYI – looks like the power saving widget got a look and feel overhaul. Either that, or widgets lost their borders, because the google calendar widget looks somewhat cleaner as well. The Corporate Calendar widget also changed. I don’t know about all of the widgets because the Facebook widget looks the same, but Google most definitely overhauled their widgets. 1st. Did you have to pay for the update?? 2nd. Did you change how the icons look? Cuz the contacts and messaging icons looks different. 2. Yes and no; those are screen shots from an emulator, not the actual phone. Yes, the top image is from Verizon’s Press Kit. It’s weird that they did that. I noticed Sprint also had images that didn’t look like the HTC Hero’s Android + Sense UI interface during their commercials as well.